Three-coat system for new or existing asphalt and concrete grounds, playgrounds, or similar surfaces. The system differs from traditional coatings thanks to the high quality of its levelling coat and top coats. This system is effective in restoring weathered and eroded areas to a smooth, refurbished playing surface. 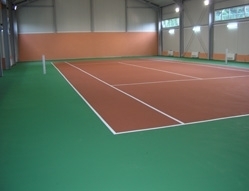 The high flexibility and wear resistance of the system makes it perfectly convenient for sport clubs with intensive use.